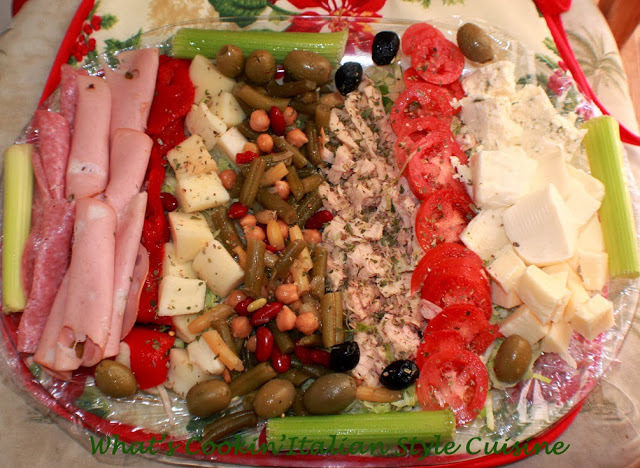 An Italian Antipasto is always the best appetizer and starter before a big Holiday meal. Check out the many variations you can add to this platter. Underneath are fancy greens but you can use any kind of lettuce you prefer although out favorite is romaine and arugula mixed. Top the lettuce with the best grade of meats and cheeses. The only thing that would be missing here would be an Italian appetite! Lettuce line your antipasto tray with any kind of lettuce you like. Suggestions would be fancy greens, ,romaine, mixed greens, iceberg. Line the plate with your greens and in rows layer any of the above suggestions. I drizzle the whole platter when filled with a homemade olive oil and vinegar dressing. Just a basic. Mix in a small bowl drizzle over the top. Serve with hot crusty Italian bread. Click here for a great recipe... Ciabatta bread.